An automated collection program consists of a special collection vehicle equipped with a mechanical arm that collects waste materials set out by the customers in a specially designed bin, instead of workers lifting and emptying cans and bags by hand. Q: Why change from the manual collection system? Residents don't need to worry so much about weight limits (within reason). The new containers result in less litter in lanes and streets. Lids always remain on the container. Dryer cleaner recyclables are easier to separate which yields more revenue. The added capacity ensures residents have all the capacity they need to recycle everything. The enclosed container makes it more difficult for scavengers to steal recyclables. Q: Do I have to use the wheeled container or can I use my blue box? Residents will be required to use the new wheeled containers as soon as they are delivered. Some locations may be exempt on a case by case basis where the use of the wheeled container is not possible. For example, apartments and townhouses may have a different system in place as directed by the Association. Q: Is there a cost for these wheeled containers? No. The wheeled containers are the property of the Bluewater Recycling Association. The wheeled container(s) is to remain at the assigned address at all times. Actual service costs are set by each member municipality. In general, service costs for this system are about the same as the current system. It is expected that recycling service will continue to be complimentary. Actual costs are covered through the general tax levy. Waste collection costs will continue to be user pay, where applicable, but the payment structure will change. Each user of the services offered by the municipality will pay based on the container size selected on a subscription basis. There will no longer be any bag tags to search for on collection day. Only those using the new containers will be collected. Note that private containerized service will be available for large generators. Pricing, frequency, and sizes are available by contacting companies in the yellow pages under the heading rubbish removal. Q: Do I have to use the services offered by the municipality? It depends on whether your local municipality has a voluntary or mandatory program. Anyone may decline the delivery of containers to participate in the waste collection program offered by the municipality and the Association at this time. Anyone choosing to manage their own waste or to subcontract to a private service provider must do so in accordance with all local, provincial, federal and international laws in effect at the time. In municipalities where service is mandatory, a fee for service will be charged regardless of your acceptance of the containers. Q: Why is there a serial number stamped on the wheeled container? Each address has a wheeled container assigned to it, indicated by the serial number stamped on the wheeled container. This helps residents identify their wheeled container and helps locate and return lost wheeled containers. Q: Can I mark the wheeled container with my Street Address? No. The Association intends to keep track of the wheeled containers by serial number, but we encourage you to record the serial number on the front of the wheeled container so the wheeled container does not get mixed up with your neighbour's wheeled container. Q: I already own, a similar wheeled container, can I use it instead? No. A wheeled container will be issued to each property on the collection system. They meet current industry standards and are designed to be emptied with the tipper devices on the trucks. Other types of wheeled containers may not meet the design to be used with the Association's equipment. Q: What size wheeled container will I receive? Each resident will choose what size container they wish to receive for use. In general, the standard set by the municipality is to provide each residential customer with one 95-gallon wheeled container (360 litre) for recycling and one 35 gallon wheeled container (120 litre) for waste. Q: Can I get a different size wheeled container? The 95 gallon wheeled recycling container will be distributed to all customers. Customers who find the 95 gallon wheeled container too big for their needs may request a 65 gallon wheeled container at no additional charge. Before requesting a smaller wheeled container, we recommend trying the 95 gallon wheeled container for a few weeks to make sure it does not meet your needs. For waste, residents can choose from a 35, 65, or 95 gallon wheeled container. Q: What do I do with my old blue box? We recommend that you use your blue box to gather the recyclables you generate in your home and transport them to your wheeled bin. If you do not wish to keep your old blue box, we recycle it. Simply place inside your new wheeled bin. Q: How big is the wheeled container? The footprint on the ground is about the size of two blue boxes. The 95 gallon wheeled container holds approximately 6 boxes or up to 6 waste bags, the 65 gallon wheeled container holds approximately 4 boxes or up to 4 bags of waste while the 35 gallon holds up to 2 bags of waste. Actual wheeled container capacity depends on how full the bags are and the type of material placed in. Q: What are my container options? Q: How should I place my wheeled container at the curb? Place your wheeled container at the curb or edge of pavement with the wheels facing the house (See directions below). After the wheeled container is collected, it is returned to the curb. Store your wheeled container in your garage or other area by your home. Please remove the wheeled container from the street within 24 hours of collection. Place your wheeled container so the arrow on the lid points towards the centre of the lane or street. Place your wheeled container so that there is at least 1m (3ft) of space on all sides and 3 m (10 feet) of clearance above. The wheeled container must be one metre (three feet) away from other objects including fences, street lights, parked cars, overhanging trees, mailboxes. Q: Can I leave my wheeled container at the curb or does it need to be put away? 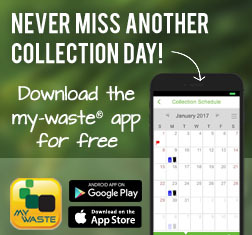 A wheeled container, may be placed out for collection no earlier than 6 p.m. the day before your scheduled collection day. It should be returned to the house as soon as possible after collection, but no later than 6 p.m. the day after collection. In the rural area, residents must remove the containers from curbside as instructed above, but they may leave the containers near the road within their property boundaries. Some residents choose to store the wheelie bins inside the fence line by a hedge or other feature and simple wheel the containers to the roadside on collection day. Q: When will it be collected? Your wheeled container will be collected on your regularly scheduled collection day. Please refer to your collection map and calendar for the collection schedule listed under the schedule tab of this site. Please remember to have your wheeled container out for collection by 7:00 am. Materials will be collected between 7:00 am and 6:00 pm. If your collection was missed, call the Association. Depending on the area collected, both waste and recyclables bins may be collected at the same time as it is done currently. In some urban areas, it is possible that the waste bin will be collected first and the recyclables bin will be collected later in the day or by another vehicle. Q: Do I have to set it out for every collection? Set it out when full (or almost full). Help us be efficient and keep costs down. Set out your container when it is FULL (or almost full). Q: How do I care for the wheeled container? Clean the wheeled container out periodically with water. Be sure to empty all the water from the wheeled container and allow to completely dry. Q: I have a yard container in which I store my blue box. Will I have to modify it? You can store the wheeled container where you please but, the wheeled container cannot be in any enclosure at the time of collection. Q: What if I need more than one wheeled container? Additional wheeled containers will be available upon request. There is no charge for the containers but any wheeled bin used for waste collection may be billed the corresponding subscription fee. Q: Can I be collected more frequently? All properties will be serviced on the level of service requested by the municipality. Commercial generators can request more frequent service based on their generation rates. It is common practice to service the downtown core more frequently to minimize the storage capacity required. Q: What if I want to change the size of my container? If you need a different sized container, contact the Association and we will exchange it once at no charge ($40 fee may apply on future changes). Q: What if I do not want a wheeled container? Wheeled containers are required to receive curbside collection service. Residents that do not wish to have a wheeled container delivered should call or email the Association as soon as possible. Without a wheeled container, recycling service access will be limited to the convenience depots and waste services will be limited to the landfill access or private contracted service. Q: What do I do if my wheeled container is lost, stolen, or damaged? The wheeled container is the property of the Association and must not be painted, abused or modified in any way. If the wheeled container is damaged or stolen call the Association for a replacement. Damage from normal use will be repaired or replaced by the Association at no charge. Customers are responsible for damage from abuse, misuse, loss, theft, accidental damage etc. Wheeled containers damaged through abuse or improper use may not be replaced and a fee may apply. Q: What do I do with my wheeled container if I move? The wheeled container is to remain at your old street address. Wheeled containers are assigned to each street address, not the customer. Q: I just moved in and I don't have a wheeled container. How do I get one? The previous resident should have left their wheeled container when they moved. If they did not, please notify the Association immediately, to establish your account. You will not be billed for the cost of a new wheeled container and interim service will be arranged at that time. Q: What should I do if I rent my house? If you rent your house, you should include a clause in your rental agreement or lease requiring that the wheeled container remain with the property. Should a wheeled container is removed by a renter the property owner may be billed the cost of replacing it. Q: What kind of accommodations can be made for elderly and disabled residents? Some elderly or disabled residents may find a smaller wheeled container easier to handle. Please try the 95 gallon wheeled container a few weeks before requesting a smaller wheeled container. A smaller wheeled container can be requested by contacting the Association. The wheeled containers are designed with large wheels and are easy to move. If you are not mobile and do not have access to a caretaker, special setout assistance can be accommodated by application through the Association. The Association strives to provide superior service to all of our customers including those with disabilities. We welcome your feedback. Please call Mark Straatman at 1-800-265-9799 extension 234 or email at mark@bra.org to share your comments or request a copy of our accessibility policy. Q: I live in an apartment or townhouse, where do I put the wheeled container? Continued use of blue boxes delivered to a central location on site equipped with up to 8 wheeled containers. Continued use of blue boxes delivered to a central location on site equipped with a convenience depot. Q: What do I do with extra recyclables if my wheeled container is full? You may deliver extra recyclables to the convenience depot. If you regularly have too much recyclables for one wheeled container, you may request an additional wheeled container.